We run initial blood screening tests on your dog to confirm blood type and to ensure they have no underlying health issues followed by a full physical examination at no cost. Tests are reviewed and if approved by our veterinarian, your dog can donate blood. It takes approximately 20-30 minutes to donate that’s why it’s important your dog has a calm temperament. What do you do with the blood my pet donates? Each donation is separated into 2-3 products: plasma and red blood cells which are used to treat and save the lives of animals suffering trauma, anaemia or clotting problems. One life saving donation from your dog will help treat and potentially save the lives of up to three other pets. Maximum 4 donations per year. OUR BLOOD STOCKS ARE CRITICALLY LOW. 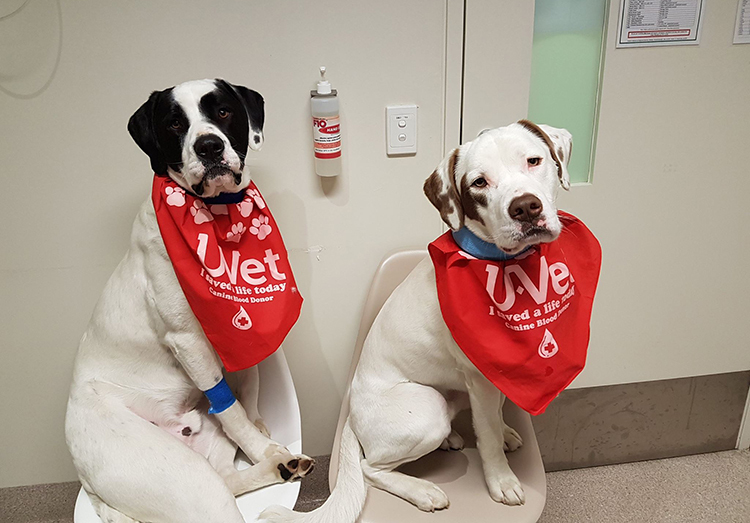 For more information, to chat to someone about donating or to sign up your dog to be a lifesaving blood donor, contact: U-Vet Canine Blood Donor Program on (03) 9731 2328 or by via the blood donor form below. 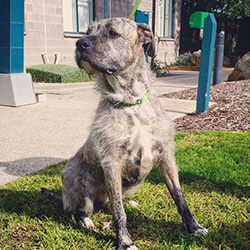 Meet the absolutely gorgeous ‘April’ the 40kg Irish Wolfhound X Mastiff. ‘April’ came into U-Vet recently to have her free examination and blood work as part of the Blood Donor Program. She very kindly donated a full unit of blood for patients in need and was an absolute pleasure to have as our new donor dog! We cannot wait until we see her again! April’s kind donation has the potential to help 3 different dogs! And if she donates regularly has the ability to help up to 12 recipient patients per year!! 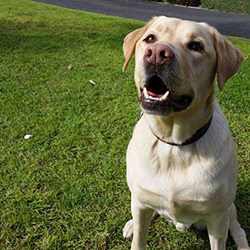 Meet the wonderful Archie who is a regular at the Blood Donor Program. Archie donates his time, blood and beautiful attitude every several months and at present has donated enough blood to potentially save the lives of 16 dogs! AMAZING! Thank you Archie! Meet Angus our newest addition to the blood donor program. Angus is a Catahoula Leopard Dog X and he is 4 years old. He recently came in to The University of Melbourne to do his first blood donation and he was the perfect patient. He sat well for all of his blood tests and then lay down for us while we took 450ml donation. Afterwards he devoured a large bowl of food. His blood donation has the potential to help 3 other dogs in emergency situations and we are so thankful to have him as our newest donor! 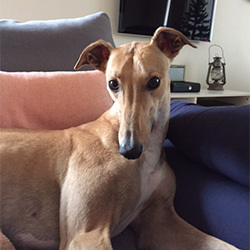 This is Matilda the stunning Greyhound who is our latest donor to The University of Melbourne Blood Donor Program. We are so excited to have Matilda on board as she has such a beautiful nature and is an absolute pleasure to have in the clinic. Matilda is an adopted Greyhound who lives with her Greyhound sister Pip. Her generous donation has the ability to help save the lives of 3 different patients in emergency situations – Thank you Matilda! 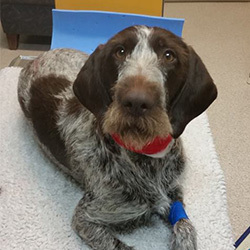 This is the gorgeous Skyler who is a German Wirehaired Pointer. So far Skyler has donated 3 times – that’s a potential of 9 dogs that have been helped with Skyler’s incredibly generous blood donation, but not only is she generous she is an absolute delight to have in the clinic! Meet the absolutely gorgeous ‘Pepper’ the stunning and sturdy 35kg Labrador X Staffordshire Terrier. ‘Pepper’ visited the U-Vet Blood Donor Program to have his free examination and blood work to see if he was a suitable donor – which he was. He very kindly donated a full unit of blood for patients in need and was an absolute pleasure to have as our new donor dog! We cannot wait until we see him – and possibly his brother - again! 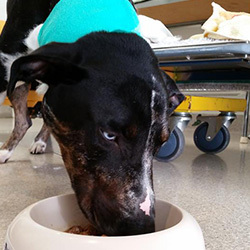 Pepper’s kind donation has the potential to help 3 different dogs! And if he donates regularly has the ability to help up to 12 recipient patients per year!! 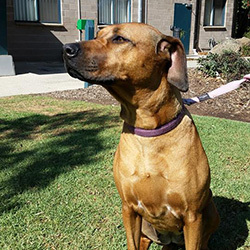 Meet Nala who is a gorgeous Rhodesian Ridgeback who has now donated twice at the UVet Blood Donor Program – that means that her kind donations have the potential of helping 6 dogs! Thank you Nala! 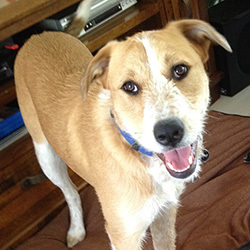 Meet the utterly gorgeous Mopane who is a Staghound cross and routine blood donor! Mopane very kindly dropped into the clinic only recently to give her 3rd donation to a patient that was very much in need…thanks Mopane – we couldn’t do it without you! 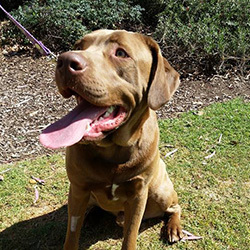 We had the absolute pleasure in meeting ‘Benji’ the Labrador Retriever when he came to The University of Melbourne Animal Hospital to take part in the Blood Donor Program. 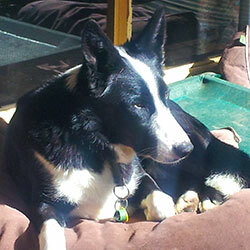 ‘’Benji’ had a full health check including lots of important blood tests. Afterwards he very kindly sat for us while he donated a full unit of blood so that it can be used to help patients in the Intensive Care Unit in emergency and critical care situations! Thanks ‘Benji’ – we can’t wait to see you again! 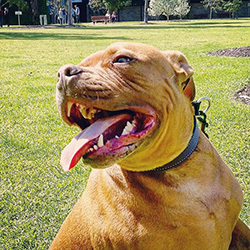 This is ‘Clay’ the gorgeous Staffordshire Terrier who we were all so lucky to meet recently! ‘Clay’ visited the U-Vet Blood Donor Program to have his free examination and blood work to see if he was a suitable donor – which he was. He very kindly donated a full unit of blood for patients in need! He was the perfect patient, thank you so much ‘Clay’!! Clay’s kind donation has the potential to help 3 different dogs! And if he donates regularly has the ability to help up to 12 recipient patients per year!! 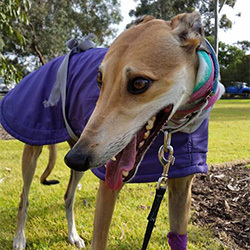 Meet Bridgette, the 4 year old Greyhound who is the newest addition to U-Vet Werribee Animal Hospital & the University of Melbourne Blood Donor Program. Bridgette popped in to visit us at the clinic last week, had a full examination and blood tests done before generously donating a pint of blood to help patients in need! She was an absolutely wonderful patient and enjoyed all the attention, cuddles and treats she received!